29 October 2014, at 12:12p.m. 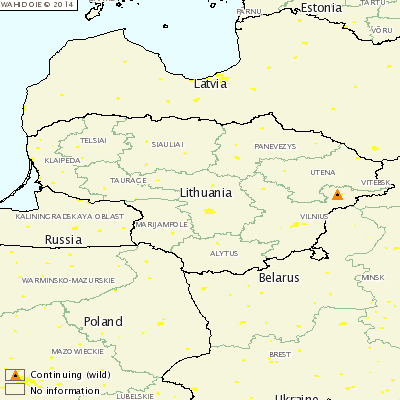 LITHUANIA - There has been one new outbreak of African Swine Fever (ASF) detected in the Vilnius region of Lithuania. Five wild boars (approximately six months old) were found dead on 27 October 2014 in Vilnius county (Svencionys district municipality) in the forest located 9.3 km from the border with Belarus and in the framework of the national ASF programme delivered for ASF testing. On 28 October, ASF was confirmed in the National Reference Laboratory (National Food and Veterinary Risk Assessment Institute) with real-time PCR. The source of the outbreak is inconclusive.